I've had this recipe bookmarked for awhile, and a few weekends ago I took the plunge. I armed myself with an armful of Bosch pears, the new Decemberists album and the quiet of a snowy morning. That's just what you do when you find a recipe for chocolate pear jam. You make it happen, no questions asked. As is so often the case with jam recipes, my yield differed from what was called for. Likely because of a mis-measurement of pears on my part or some science-related explanation of the air quality and humidity levels that morning. I doubled the recipe and ended up yielding only 3 1/2 half pint jars, instead of the four I imagined. Upon finishing up, I promptly made a batch of scones because I had to. 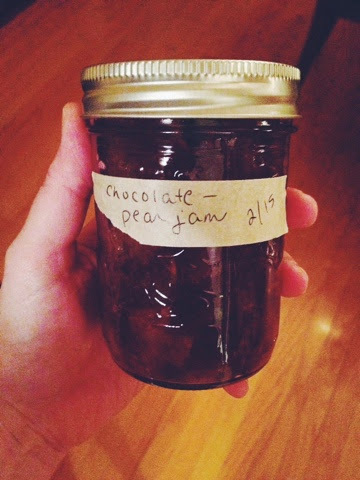 Again, it was chocolate pear jam protocol and I had no choice. Croissants would have also been an acceptable option, and in that case you would do well to just buy them at a local bakery because 1) no one has time to make croissants and 2) I never want to witness how much butter goes into them. It would ruin the experience. 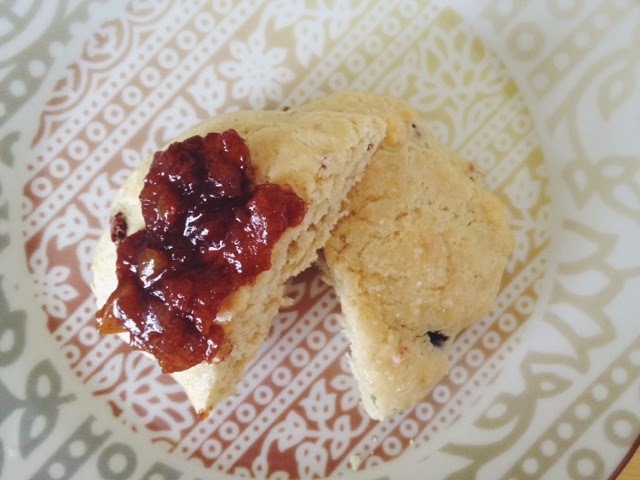 That afternoon, I spread a generous portion of chocolate pear jam atop a freshly baked scone and I thought to myself, "This will save lives." Now, I don't know if that is strictly true in the medical sense of things, but I do know that I will never underestimate the medicinal properties of warm chocolatey pear jam and a pastry. It helps if you stand over the stove stirring the jam and staring out the window as the snow falls, but you might be able to get the same benefit by stealing a jar of the good stuff from someone else. I don't know, but that's why I'm on a mission to put up jars of weird, delicious things you won't easily find at the store. What was once just a shelf to show off my preserves has become an apothecary of sorts, and anything with chocolate in it is bound to show up on the prescription pad. Would you try chocolate pear jam? You really should. I wonder if my batch is more chocolate-y than the author intended but, then again, I'm not sure that's actually a problem. This is a phenomenal fancy jam that will totally win over your house guests or make your gift of a home-canned jar of something seem really special and not like an afterthought. It's the real deal. Recipe is another good one fromPreserving by the Pint: Quick Seasonal Canning for Small Spaces. 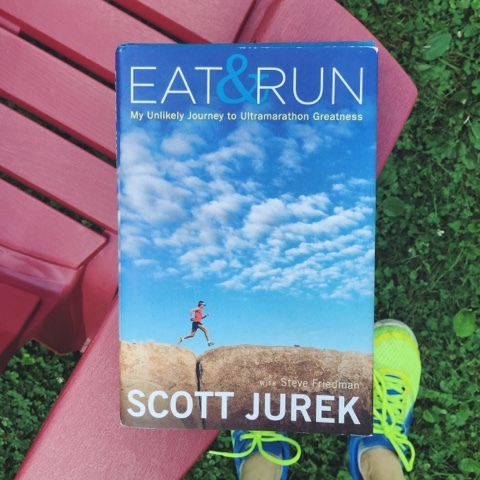 You can find a similar, but not quite the same, recipe on the author's website Food in Jars. Continuing my strategy of canning only the weird recipes, right after the holidays I made up a batch of cranberry ketchup using the recipe in Food in Jars. While I was at it, I used the leftover cranberries to make a few jars of cranberry simple syrup to freshen up seltzer and cocktails. What's cranberry ketchup? I, like so many of you, was totally thrown off the first time I heard about non-tomato ketchup. WHAT DO YOU MEAN, NO TOMATOES?! That's the beauty of these weird little recipes; they blow up your preconceptions and smash your traditions. I like that sometimes. As it turns out, you can make ketchup from lots of things that aren't tomatoes. What makes ketchup so ketchup-y tends to be the spices and flavor you add to the main ingredient. So for the cranberry ketchup, I sweetened it, spiced it, added onions to it and cooked it way down to a thick, french-fry-dipping consistency. The verdict? Pretty tasty. It tastes exactly like cranberry ketchup should. Undeniably in the ketchup family, with a slightly odd tartness from the cherries. It hasn't replaced my other ketchup substitute, the beloved tomato jam, but it's a nice switch from my sugary, processed Heinz bottle. And yes, if you are wondering, I'm a ketchup person. I bastardize my eggs with it and dip everything in it I can find and, in my wild youth, had been known to put it on my mac and cheese. It's blasphemous, but it's delicious. At least I'm trying to expand my ketchup palate, right? After my last post, I did some more canning and even though it's no longer peach season and these definitely weren't grown locally, I tried out two incredible peach jam recipes that the world should know about. One is a sweet Salted Brown Sugar Peach Jam, best used on oven-warmed croissants or hearty slices of toast. Or, perhaps, just on a spoon. It's got a gooey caramel flavor, which should be enough information to tempt you into making a small batch of it right this moment. I'd rather make small batches of weird things all year round than spend a hot & humid weekend holed up in the kitchen putting up gallons of something boring. For example, I like tomato sauce. I loved getting together with a friend and making a few quarts. But that was my limit. I didn't need to do much more. I'd rather have a pantry full of strange concoctions that really spice up my cooking, things I can't readily buy at the store. Because here's the secret: sometimes other people or companies are better at making things than I am. Not always! (See Quiches, Homemade.) But sometimes. And I'd rather just buy those. Hopefully from a smaller, local producer but even then, not always. Make weird recipes and put them in jars! That's the new theme of my home canning and preservation strategy. Both recipes from Marisa McClellan's new book Preserving by the Pint: Quick Seasonal Canning for Small Spaces. You can download the cute canning labels over at From Scratch Club. Have you really not given tomato jam a try yet?